My recent posts have been about timber-framed houses, but here's something more unusual: a timber-framed church tower. The tower at Upleadon dates from around 1500, the same period as the glorious merchant's house Paycocke's, which I featured in my previous post. As at Paycocke's, the framework is close-studded and infilled with brick, although here the brickwork (but not the woodwork) was renewed in the 1930s. The rest of the church (of varying dates form Norman to 19th century) is built mostly of sandstone with some patches of limestone. 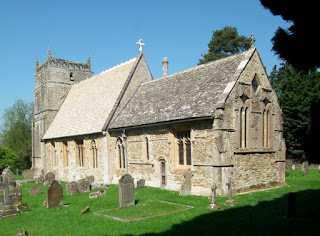 The part of Gloucestershire (the northwest of the county) where this church is situated is not renowned for its stone – we are a fair way from the limestone country of the Cotswold part of the county – and scarcity of stone no doubt caused the builders to use a different type of structure for the tower. 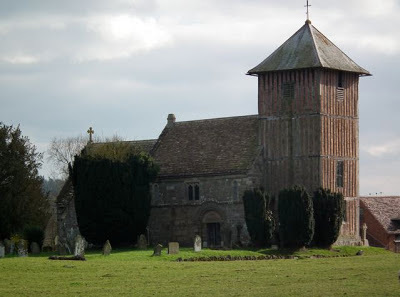 The church is also built on a clay mound and perhaps the builders thought a timber-framed structure, lighter than thick stone walls, might work better on a site subject to movement. Whatever the reason, Upleadon's brick and timber tower, on its slight rise above the River Leadon, makes an arresting sight. Last for now in my line of posts about timber-framed houses is Paycocke's, the beautiful merchant's house in Coggeshall, Essex. Paycocke's was built in 1510 for Thomas Paycocke, a member of a rich family of cloth merchants. Although the house was much altered in later centuries, this street frontage is very much how it would have been in 1510 – there was a restoration in 1910, when some of the woodwork was replaced (with carving by Ernest Beckwith), but much 16th-century timber survives. And there is a lot of timber, because this frontage is close-studded – in other words the framework is made up of a large number of closely placed vertical posts. This was a high-status way of building, only available to a client with the money for lots of wood, but for those who could afford it both very satisfying to look at and very strong structurally. Close-studding is particularly associated with the prosperous towns and villages of East Anglia, although close-studded houses can be found in many other parts of England too. Another thing a rich owner could afford was decorative carving, and Paycocke's has a lot of this – on the big horizontal beam, on the windows, and elsewhere. Snaking vines, carved heads, and the initials T. P. and M. P. (presumably for Thomas Paycocke and his wife Margaret) all feature on the carved front. This ornamentation, together with the mullioned windows and flattened arches, is very much in the Gothic taste of the time. The Renaissance was late coming to this part of England, but the house is none the worse for this – its creators were artists of the late Gothic as accomplished as the builders of many medieval churches. 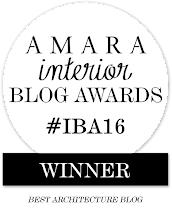 The quality of this building, with its fine timber frame and herringbone brick infill, has long been recognised. One of its greatest champions was Lord Noel-Buxton, who bought the house in 1904, commissioned the 1910 restoration, and presented the building to the National Trust in 1924. The Trust give more details of the house here, and there is even a Paycocke's blog. 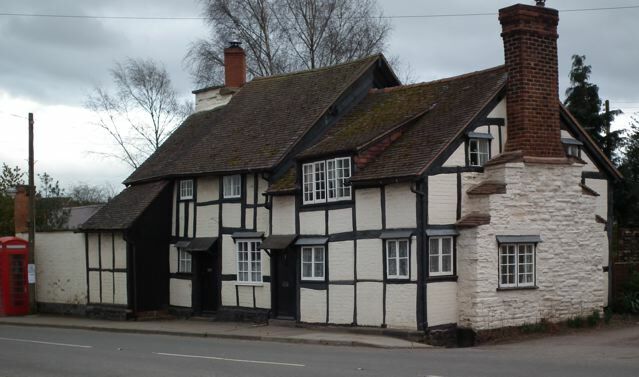 In contrast to the rather grand timber-framed houses in my previous posts, here's a more modest example from Herefordshire. This pair of houses in Bosbury are probably 17th century, although they have been much altered (for example, with the fitting of new window frames) in the 20th century. They have white-painted brick infill between the timbers of the rather irregular frame and the somewhat rustic-looking irregularity, with a frame consisting of different sized rectangles, timbers of varying widths, and features such as half-dormers, adds up to a kind of building quite often seen among the villages and farms of Herefordshire and the west of England more generally. Another common feature of the timber-framed houses in this part of England is the large stone chimney stack at the end of the building, positioned to keep the heat of the fire away from the vulnerable timbers. It would perhaps originally have contained a very large fireplace but now, of all things, there's a window in one side of the stack and there must be a relatively small fireplace with a diagonal shaft running up to the brick chimney above. This post continues my short series on timber-framed buildings with another type that is associated with a specific English region. This is the Wealden hall house, a form that is most common in the Weald region, which covers part of Kent and neighbouring East Sussex. 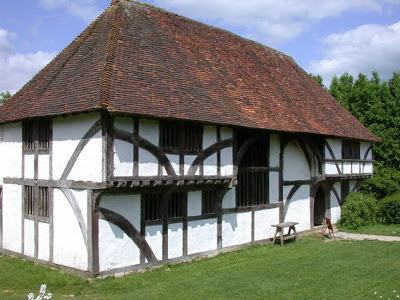 A Wealden house is a timber-framed building with a central, double-height hall heated by a central hearth, the smoke from which would originally have escaped through a hole in the roof. On either side of the central hall are two-storey sections, with their upper floors overhanging slightly, so that the central, hall section of the house is recessed. There would be service rooms on the lower floor of one of these side sections, with private rooms called solars on the upper floors. My picture shows the beautiful Wealden house known as Bayleaf, originally built at Chiddingstone in Kent and relocated to the excellent Weald and Downland Museum. The house dates mainly from the early-15th century with alterations from the 16th century. With its large rectangular panels of wattle and daub, with curving cross-braces, it is very attractive, although some Wealden houses have a still more striking type of framework made up of many closely positioned vertical timbers. The name Bayleaf may derive from Bailey, the surname of the first occupant in the 15th century. Harry Bailey and later tenants and lessees of the house were farmers and Bayleaf seems to have been associated with a landholding of about 100 acres of probably mixed farmland (cattle farming dominated in this part of Kent, but a holding of this size most likely included some arable as well). This would make it home to people who in modern terms we might think of as members of the rural middle classes. Wealden houses were not only found in the Weald. There are also some examples in Surrey, Essex, and even further afield. But Kent and eastern Sussex are their heartland and they form one of the most distinctive and attractive regional types of timber-framed buildings. The website of the the Weald and Downland Museum, which I must visit again soon, has more information about Bayleaf. The photograph above is by Keith Edkins, and is used under the Creative Commons Attribution-ShareAlike 2.0 Generic license. 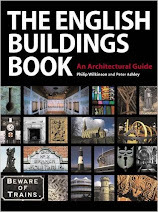 One of my readers asked me, in response to the previous post about a building in Buckinghamshire, whether I had any thoughts on regional variations in timber-framed buildings. Just a few, so I thought I'd do a group of posts about such structures in different parts of England. One of the most rewarding places to look at this type of building is in the west Midlands and the counties that mark England's border with Wales. In this area Shropshire and Cheshire in particular stand out: one of the features of the local architecture here is a tendency towards highly ornate timberwork in which the frame is made up of many small square sections, themselves embellished with additional woodwork in the form of a multitude of diagonal braces, quatrefoils, small arches and the like. Carved bargeboards, brackets, and ornamental heads add to the effect on the most elaborate buildings. 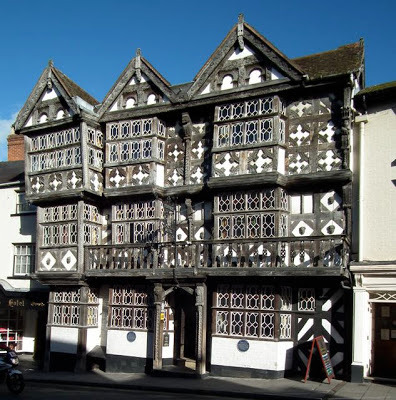 A town in which all these details can be seen is Ludlow, and perhaps the most magnificent timber-framed building in Ludlow is The Feathers, built in 1619 as a house for a Welsh lawyer, Rees Jones, and as dazzling a display of conspicuous wealth as you'll see on an English street. The building became an inn in about 1670. This is high-status architecture. There are many buildings in this region with much plainer woodwork. But for rich merchants, lawyers, and landowners who wanted houses that stand out on a crowded street, Shropshire's carpenters had the skill to fit the bill. 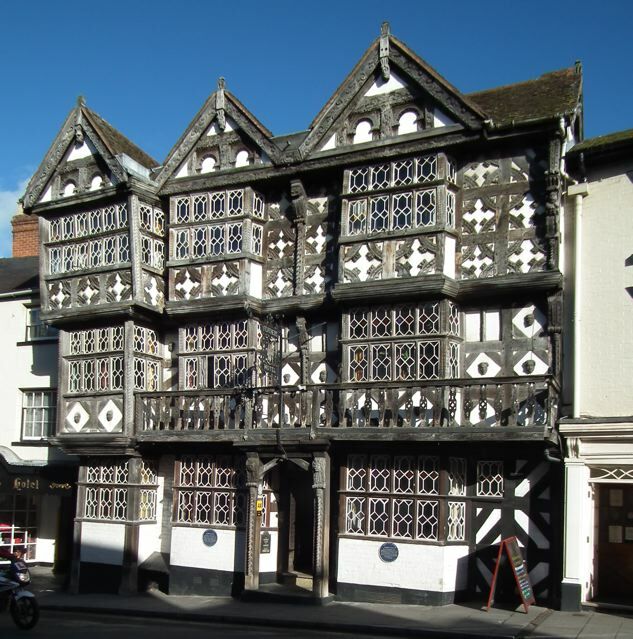 I've posted before about Shropshire's dazzling timberwork here and here. Walking around Wendover looking at house fronts and brickwork, I was soon struck by Vine Tree House, with its front of about 1700. In a mottled wall of varicoloured brickwork – predominantly diverse shades of red but with darker bricks dotted around in it – are sash windows and a simple door case with bracketed canopy above. The cut outline of the brackets give the door case just a hint of swagger, no more. Very English. Looking at the house at first from the front, it didn't take me long spot that all was not as it seemed. The off-centre door and the uneven spaces between some of the windows didn't seem quite right for a building of 1700 or soon after – and what was that roof poking out above the parapet? When I got to the corner of the building, all was clear, as you can see. 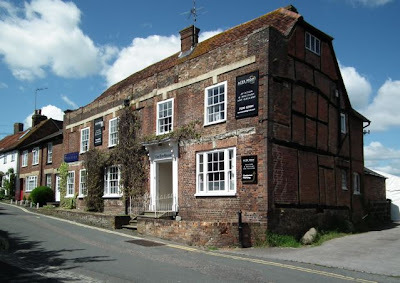 This is actually a much older timber-framed building, which has been refronted – something that quite often happened when timber framing went out of fashion, as I've noticed in this blog before. The end of the building comes from another world – all irregular, with a half hip to the roof and a variety of beams that are probably Elizabethan or maybe early-17th century. But the spaces between the timbers are filled with brick hogging, so thanks to these red bricks, the structure has some visual unity after all. Very English indeed. Boston Stump, the Gherkin, the Shard: we like to give nicknames to buildings, especially towers, of unusual shape, and this selection suggests a tendency to try and bring them down a peg or two – but in an affectionate sort of way. There's something of the same effect about this example, sometimes known as the Pepper Pot. It's one of the major landmarks in Upton on Severn, and is an eyecatching sight as you enter the town from the Malvern side. It started out as the tower of Upton's church and was a plain medieval sandstone structure topped with a spire and with buttresses at the western corners. In the 17th century the church was the scene of fighting when Royalists tried to stop Parliamentary troops crossing the nearby bridge over the Severn. 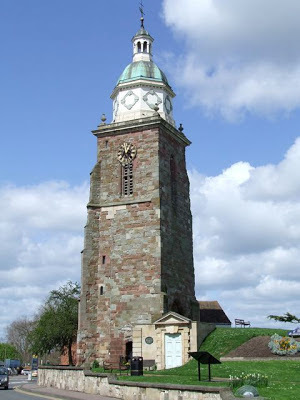 In the 1750s the medieval church to the east of it was rebuilt in classical style and in 1769–70, when the spire became unsafe, the octagonal pepper-pot, copper-clad dome, and tiny openwork lantern on top were added, to make the tower look more in keeping with the rebuilt church. 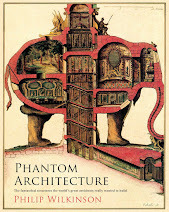 The architect was Anthony Keck, who had quite a large practice designing country houses in Gloucestershire, Worcestershire, Herefordshire, and South Wales. He was a classicist and a follower of Adam, and his addition to the Upton tower has something of Adam's delicacy. About a hundred years after Keck's pepper pot was added to the tower, it was decided to go in for a larger church at the other end of the town. This, a Gothic structure with a spire, became Upton's main church and in 1937 the old church was pulled down. * All except for its tower and ornamental pepper-pot top, which remains to house a heritage centre and to surprise passers-by. * Putting their cards on the table as usual, the BBC reported recently on their website that "the knave of the church was demolished in 1937".